Orphan Rock is a wooded valley with a prominent rock plateau at its center, home to a group of witches or hags, led by a hagraven. This location shows no sign of habitation and the rock plateau is not easily accessible until you are sent to retrieve Nettlebane during The Blessings of Nature. 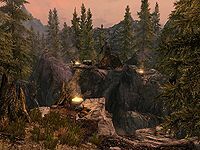 The path leading up to the rock leads from the road between Helgen and Ivarstead. The path leads north from the road, so the normal approach is from the south. Caution is advised when traversing the area. Four elemental rune traps, two bear traps, and two sets of sharpened stakes, similar to those at the bottom of a spike pit trap, can be found all around this location. Under the bridge, near one of the sets of sharpened stakes, is a dead bandit. There are a large number of purple mountain flowers and a few patches of mora tapinella fungus found in and around the camp. As you approach from the south there is a fallen tree on the left; next to this is a spike with wolf heads on it. The other end of the tree is hollow and there is a lootable skeleton next to a coin purse and a random helmet inside. There are two witches or hags on the valley floor and two resting near the tent by the path at the top of the slope. All four of the witches or hags will attack on sight, using low-level Destruction spells and daggers. Orphan Rock itself is accessed by crossing a tree trunk that has been felled across a small chasm near the tent. It is guarded by a single hagraven with more powerful fire spells. It is possible to fight the first set of witches without alarming the set on the upper level and the hagraven. On the nearside of the tree, there is a tent off to the right containing two unowned bed rolls, an adept-locked chest and a food sack. 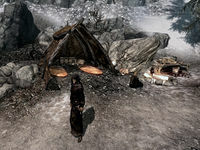 To the right of this tent are several barrels and sacks, most of which contain food, however one barrel contains ingredients and has a lockpick on top. 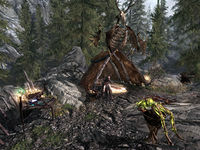 In front of these is a campfire and a wooden table beside it with a skeleton on top that can be looted for a few septims. The most notable loot is Nettlebane, found on the body of the hagraven. There is a chest containing random loot and an unowned hay pile in the hagraven's tent on top of Orphan Rock and an arcane enchanter to the left of the tent. On top of the enchanter is a random filled soul gem, a deathbell flower, a hagraven claw, and a sample of hagraven feathers. In front of the enchanter is a large bowl on a stand with the body of a dead spriggan lying on top; this can be harvested for a taproot. There are also two silverside perch lying on the rock among some blood splatters in front of the tent. There is a moonstone ore vein north-northeast of Orphan Rock, between this and North Skybound Watch. Southeast from the hagraven's tent, past the dead spriggan, are two rubies suspended in mid-air, on the peak of a rock. This page was last modified on 27 February 2018, at 19:57.